Dr. Boderman, an Allentown native, graduated from the Illinois College of Optometry, where he received the Yale C. Knight award for retinal research. After graduation he became board certified, making him a Fellow of the American Academy of Optometry (FAAO). He has served as the past president of the Lehigh Valley Optometric Association and has been an examiner for the National Board of Optometry. 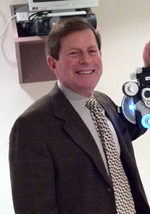 He practices general optometry and specializes in contacts, pediatrics and eye diseases. Most recently, Dr Boderman was honored for receiving the "Lehigh Valley's Best Optometrist" readers choice award by the Morning Call Chronicle. We are dedicated to providing you with 20/20 vision by utilizing the latest eye care technologies to accurately determine your prescription as well as checking for all eye diseases. Diagnosing diseases in the early stages like glaucoma and macular degeneration are critical to keeping your eyes healthy and vision 20/20. We believe that communication is the key to your satisfaction and every attempt is made to ensure that you understand what is happening with your eyes.